In a heavy skillet, cook the leak whites in some butter, add the potato and the pumpkin that has been peeled and cut into cubes. Add a glass of water. Let simmer. Check consistency after 15 minutes. Add salt and pepper to taste. When ready to serve, blend the soup and reheat. 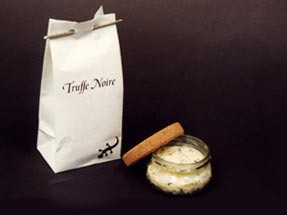 Serve in transparent glasses, pour a little liquid crème fraiche on top and sprinkle with raw truffle slivers. Should be served with cocktails or a small appetizer.